Figures are starting to come in from London’s investment in “cycle superhighways,” and the data make a strong argument for more robust dedicated bike infrastructure. A Transport for London study found that cycling is up 70 percent along routes where the city’s beefed-up bikeways were installed, reports Network blog Cyclicio.us. Part of the increase is probably attributable to the debut of London’s bike-share system and all the new “Boris bikes” available to the public since summer 2010. There seemed to be a variety of arguments against segregated bicycle infrastructure, but most of them seemed to be made by people who have never left Toronto and haven’t seen photos or videos of bike infrastructure in other cities. First of all, segregated bicycle infrastructure needs to be wide enough to allow bicyclists to overtake other bicyclists – that is true. Montreal and Vancouver have segregated two-way bike lanes that allow bicyclists to go into the on-coming lane (when clear) to overtake a bicyclist (if there isn’t enough space). European cities like Copenhagen or Amsterdam typically have cycle tracks that are plenty wide enough to overtake another bicyclist. To prevent “door prizes” when parked cars are present, a buffer zone should be built in. New York’s 9th Ave is a good example of how you can have a buffer zone beside parked cars – however, this requires more space. Even if this was considered an issue, you could always use bollards (like they use in Montreal), [or] fences or grass islands like they use in China. If Toronto area decision makers need further convincing, they need only look to London or New York. Elsewhere on the Network today: Greater Philadelphia Bicycle News reports that a New Jersey assemblywoman has introduced legislation that would require licensure for cyclists; Cycle and Style outlines the top ten major developments in cycling over the past ten years; and Baltimore Spokes shares a tip on rallying public support around safe conditions for cycling. The article you are referencing is my article from theurbancountry.com. Looks like “Livin in the bike lane” re-printed it without credit. While cycling has gone up somewhat on the cycle “superhighways”, there is a lot of doubt that they have created new cyclists (yet) — more likely, the rise is from people switching from more convoluted but quieter back streets. There are two superhighways active so far, and they’re of quite different design: CS7 is a painted cycle lane on a busy arterial road in the south, with very little to prevent motor vehicles driving and parking in it. CS3 in the east is largely segregated or on only quiet roads. (In both cases, a large amount of the infrastructure was already in place, and the superhighways scheme was as much a marketing project as it was construction project.) The streets of CS3 have seen a greater percentage increase in users than CS7, and CS3 received a much better perceived safety rating than CS7. However, a negligible proportion of users of either “superhighway” say that the superhighways have caused them to take up cycling or cycle more often, even on the more pleasant CS3. So the claim that the number of cyclists using them probably only reflects the fact that people are moving onto them from neighbouring corridors. Perhaps people are put off by the fact that the superhighways dump them on congested central zone streets where there are few good cycling facilities on which to continue their journeys. Shame on you guys for ripping off my buddy’s article. Who does something like that? Apologies. Content in this post was originally attributed to a blog that had reprinted content from another source without attribution. The post has been changed to reflect the correct author. Thanks for updating Angie. I’ll have a chat with the author of the other site 🙂 Cheers. 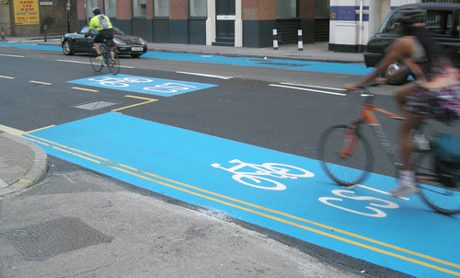 As a biker I am glad that they put marked bike lanes in London. Excellent. Yet to call them “super highways” gives into some poor PR promise. They are marked bike lanes! Not a highway! If you call them that then folks assume that that is the best not what they really are to be called painted pavement. Lets not fool our selves and get caught up in this game.